The fire in the Mallee region of South Australia occurred on the 20th January 2018. The fire, which was started by lightning strikes the day before, burnt through native vegetation near the Karte Conservation Park and within the Peebinga Conservation Park. The FireFlight system was used to image the fire at a height of 9000 feet above ground level, at approx 1600 local time on the 20th. At the time of the flyover, crews had completed back burns to the north eastern boundary, and to the southern boundary, establishing control lines. 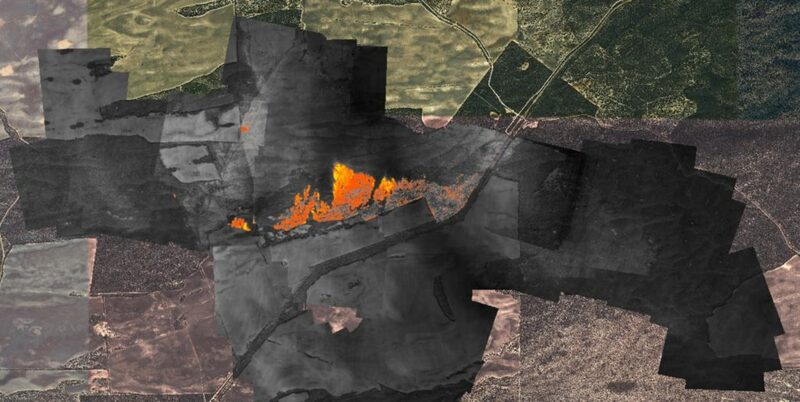 The image below is a composite of six flight runs that were flown over the fire over a period of 20 minutes. During this time the fire moved a small distance to the north and west.